It’s the last kind of a headache you want to deal with as a building owner: a leaking roof. Whether or not you do business in the building you own, the discovery of a leaking roof causes stress and sometimes panic if someone else’s property is getting ruined or tenants are beating down your door. The good news is that there are easy-to-spot signs that almost always originate from one of only a few trouble spots. With the proper action, you can keep that leak from getting worse and prevent more damage to your building or others’ property. Have you seen a telltale brown spot on your dropped ceiling tile? It needs to be investigated. Any dripping from the roof will eventually create a discolored spot on your ceiling system. The stain also means this area has been exposed to water over time. Are you getting complaints of a foul odor in your office building? You may have a mold problem as a result of roof leakage. Furthermore, if there is mold, it often means you’ve had water entering your building over time, and it will spread. The best possible plan is to get that mold removed and your roof fixed immediately. Puddles or drips are the number one indicator that a leak has developed. The membrane of a roof is the all-important element. It’s the waterproof layer that keeps water out of the building. A commercial roof can’t shed water like a sloped roof. Therefore, any puncture to the waterproof layer increases your risk of leakage immensely. You need to get regular inspections and patch this damage as quickly as possible after a storm. Flashing is the membrane and or metal shield installed around the areas in your roof that form part of a working roof system – chimneys, skylights, interior walls, and roof edges. It protects against leaking. However, if damaged, it can allow leaking. These necessary penetrations in your membrane: doors, vents, drains, pipes, HVAC units or any other system that comes through your roof. Although many commercial roofs are made to house these systems, any penetration in the membrane is vulnerable. In addition, they need to be adequately sealed and maintained. One of the most significant problems for a flat roof is whoever installed it didn’t take it into account is drainage your roof needs. It can also be a problem if you skip out on regular maintenance. If these aren’t cleaned regularly, or if your roof doesn’t have enough drains, water will pond and eventually get under the membrane, not to mention adding weight to your structure. Commercial roofs don’t last as long as sloped roofs. Even with proper maintenance and repairs, an old commercial roof is more prone to all of these problems and needs to be replaced. Your local building codes may allow you to install up to 2 roofing systems on your building. However, you should know that if it’s time to tear them off and install another system, it will be best for your building and your wallet in the long-run. Keep your building from more damage. If you have drips or puddles, it’s time to clear out people and supplies. Assess visual points of leakage. Mark where you see the leaks coming in, so you have something to tell your contractor and insurance provider. Survey the whole building. While you’re looking, make sure you’ve found every leak that might be there. Call a qualified contractor. You need a professional commercial roofing contractor to tell you exactly what’s leaking and how they can fix it. Call the insurance agent. Internal damage may be covered under your plan. Review your warranty. Some manufacturers or contractors warranties may cover the damage or leaking you’re experiencing. A reputable contractor will fix his mistake – if the leak is his fault. In conclusion, commercial roof leaks are a huge, costly pain. The solution is to work with a professional commercial roofing company, keep up with required maintenance, and replace a commercial roof as soon as it’s time. 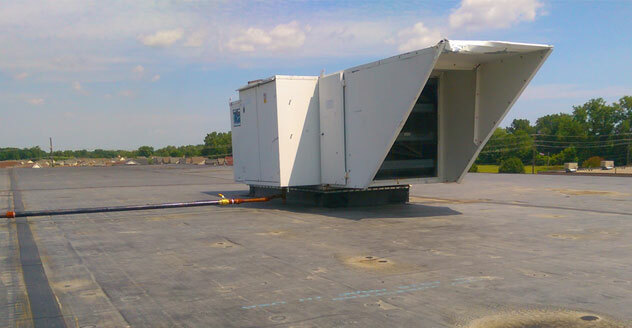 If your commercial roof is experiencing a leak and your building is located in Southeast Michigan, please call. We would be happy to help guide you through the process of making it right.